Sweet Potato Treats For Your Dogs- Healthy & Easy to Make! Sweet Potato Treats for Your Dogs – Healthy Treats and Easy to Make! Winter is here and it’s cold out. It’s a good time to hone in on your cooking skills and try new recipes. 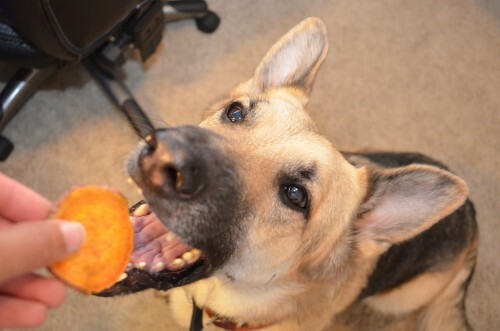 While you’re cooking, why not try some sweet potato treats for your dogs? 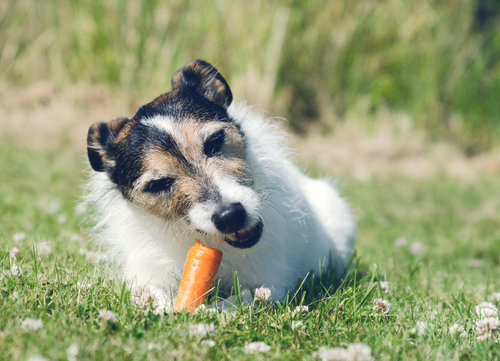 Sweet potatoes are loaded with Vitamin E, B6, potassium and iron, which would make healthy, hearty treats for your dog(s)! They are super easy to make and you don’t need a Master Chef certification to get them right! 3. Cut off one side of the sweet potato lengthwise, as close to the edge as possible. Cutting the side of the potato allows you to then turn the potato onto this flat surface that you have just created. Having a stable area to rest the potato will make it easier to cut the potato into slices. 4. Cut the rest of the potato vertically into 1/3″ slices, no smaller than 1/4″. 5. Place them on the prepared baking sheet. Bake for 3 hours, turning half way through. 6. Cool completely on a wire rack. 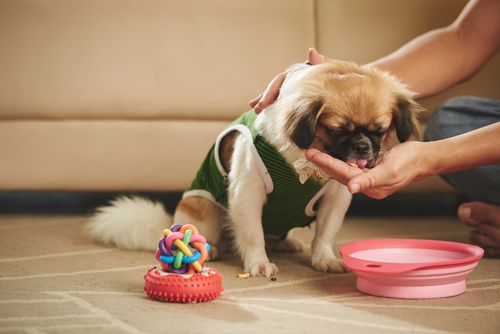 As with all hard treats, adjust the size of the pieces so they are appropriate for your dog and do not present a choking hazard. How to choose the sweet potato – You want to find a potato that is as uniform in shape as possible. This will help them all cook through at the same time. Also, try to find one that doesn’t have any bruises. Cut even pieces – First rest your knife where you would like to cut. Then press down gently across the entire length of the knife and cut all the way through. Chewiness – Baking for 2- 3 hours will result in a soft, but chewy dog treat. If your dog prefers more of a crunch, then bake for an additional 20-30 minutes. Finished color of the treat – Sweet potatoes can vary in flesh color when raw. So, when baked they can be lighter or darker than the chews in the above photo. The texture is what you need to be most concerned with. Bake longer or shorter for the texture that your dog prefers. 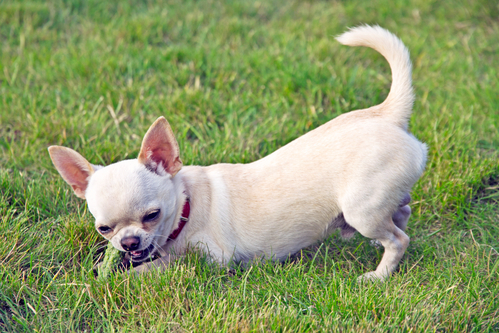 Practice makes perfect so you can monitor the directions to your dog’s needs. But, how nice, to have a healthy, homemade treat for your beloved dog!